(Left to right) Guy Uberti, Jorge Arango, Andrea Villamarin, Wayne Murray, Justin Icenhour, Dana McManus, Tatiana Kharina, Sandra Soltoff, Karina Ferro, Michael Soltoff, Evan Soltoff, Karsten Schmalenbach, Brittany Espari, Michael Brinkjost, Leslie Hodge, Kegan Wilson, Micky Nguyen, Chris Esguerra, and Gabriela Espinoza. 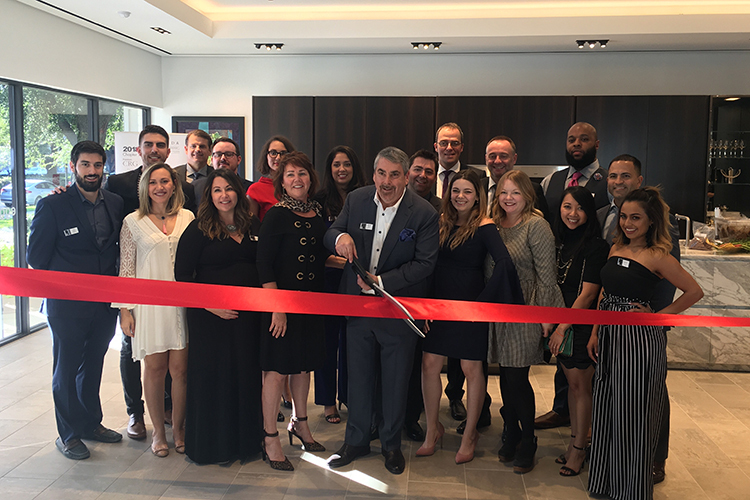 On October 10, 2018, eggersmann USA, a luxury German cabinet manufacturer, celebrated the grand opening of its showroom in the Design District Dallas with a ribbon-cutting ceremony. The 4,100 sq. ft. studio highlights the eggersmann Kitchens & Home Living concept with 6 lifestyle displays featuring kitchens, dining & living spaces, entertainment areas, and a master suite wardrobe. These custom cabinetry vignettes highlight a few of the whole-home solutions that eggersmann offers. The offering of solutions for every room in the home sets it apart from other German cabinetmakers.